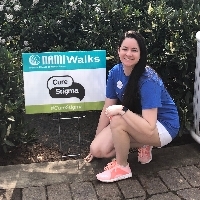 I have always wanted to participate in a NAMIWalk because I think it is vitally important to decrease the stigma surrounding mental illness. I personally have many diagnosed mental illnesses and they do not define me or change who I am. I also work in the mental health field as a counselor and have seen too many people get beaten down by their illnesses. I am lucky to have supportive family and friends willing to walk with me and help me to end the stigma!